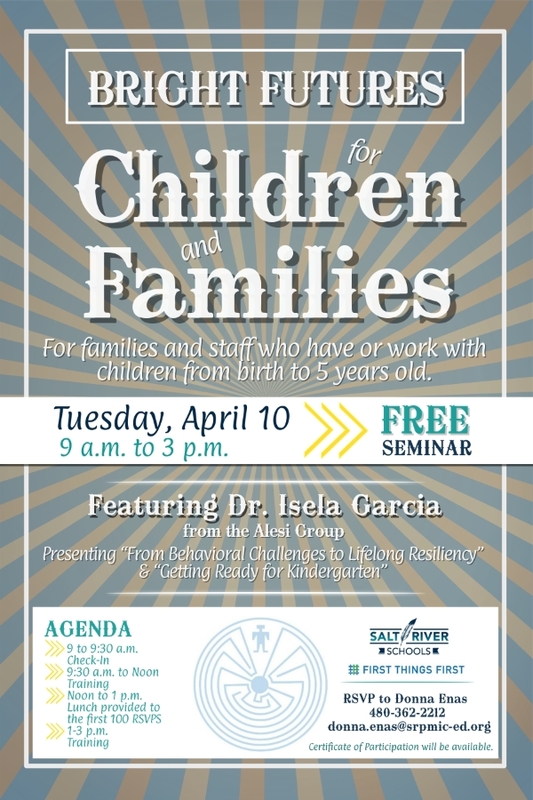 Families and staff who have or work with children from birth to 5 years old are invited to attend this amazing (and FREE) seminar! A Certificate of Participation will be available to those who need/request one. Lunch will be provided to the first 100 RSVPs! RSVP to Donna Enas at 480-362-2212 or email to donna.enas@srpmic-ed.org. Why does he do that? She knows better than that! I’ve told him a thousand times! Why doesn’t he listen? As a parent of young children, we often feel overwhelmed by misbehaviors. Sometimes it might feel as though children are misbehaving on purpose. Interestingly, there are reasons why children misbehave and it all has to do with neuroscience—THE SCIENCE OF THE BRAIN! Join us as we get the heart of why children misbehave and what we can do to help them build a strong sense of self and the ability to be resilient—to bounce back when life gets difficult. Surprisingly, these foundations begin in the earliest years in life! We all want our children to succeed in life. What research tells us is that KINDERGARTEN is a critical year for future academic success! There is so much we can do as parents/families of young children to help them experience success and it isn’t ensuring they know their ABCs and their 1-2-3s. Join us as we explore what’smost important about kindergarten readiness!